Choosing to breastfeed has so many benefits for you and your baby. You may also want to express some breast milk for times when you can physically nurse your baby. If you want to pump occasionally then a manual breast pump is what you need. Otherwise, check out our electric breast pump buying guide. Most breast pump guides are aimed at an electric breast pump. We created this one specifically for manual breast pumps. We’ll help you wade through all the information so you can find the perfect breast pump which fits your family’s needs. First let’s start by looking at our top 5 best rated manual breast pumps. 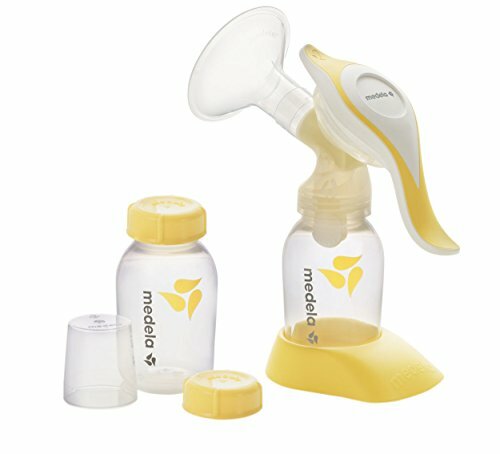 The Medela Harmony is the most popular manual breast pump on the market. It’s the only manual breast pump made by the Medela. They have tried to include their two-phase expression system into this pump. You turn the handle to start with fast, quick motion. Then turn again to change to long, slow motion. This mimics that way your baby feeds and helps you get more milk when pumping. It’s a great quality pump which will last a long time. It comes with a Medela collection bottle and breast shield. These are all interchangeable with the electric Medela breast pumps if you decide to move onto one in the future. If you need extra equipment such as bottle teats, or a larger breast flange, it’s very easy to get addition parts for this pump. The Philips Avent Comfort Manual is the most comfortable pump on our list. The shield of the pump is designed to site at an angle, which makes it much more comfortable to press whilst sitting. Another comfort feature is the textured petals in the shield. This helps to massage the breast as you pump, to encourage more milk flow. You can collect milk in the bottle then feed baby with the teat they supply with the pump. We found that the wider pump handle was much easier to use than our other pick, and resulted in less hand fatigue after a while. 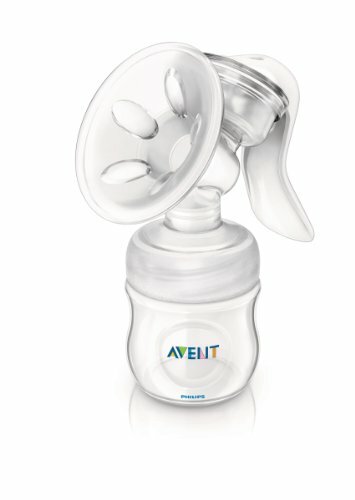 Whilst you can’t buy different breast shield sizes, you can use other Avent bottles with this pump. The Lansinoh Manual pump is our most efficient choice. The shield is designed with a soft rim which makes it comfortable to use but also give a tight suction. This pump is extremely effective even on petite and plus-size breasts, as you are supplies with two shield sizes (25mm and 30.5mm). It’s similar to the Medela as you can use the two-phase expression with a simple switch. You are supplied with a collection bottle; however, it will fit most wide necked baby bottles. We love how easy this pump is to assemble, which make it easier to clean between uses. The Sumgott manual breast pump is a newcomer, but very popular with moms. It has a comfortable breast shield with petals similar to the Philips Avent Comfort. Moms report that it’s just as effective as a good electric breast pump for removing your breast milk. This pump is very lightweight and compact to carry it around. We highly recommend it for travel use or returning to working part-time after maternity leave. The only color the feeding bottle comes in is pink so you may not want to use it for a baby boy. You’ll need to decant the milk as it doesn’t fit other branded bottles. The Zenda Naturals is a great budget manual pump. It’s based on the design of the original HaaKaa pump, but with higher ratings. This pump has a gentler approach the expressing. It’s made from soft silicone and removes milk from your breast by applying gentle pressure to the collection bottom. For regular expressing it may not be effective enough. However, we would highly recommend it to use as a pump to relieve engorgement when you are away from baby. It’s also a great pump for catching expressed milk from hand expressing. We love that it’s really compact to carry around. It only has the one piece, so you don’t need to assemble it or clean numerous parts. Before you buy your breast pump, consider what features are essential to you. We’ve found the functions that rate as important to moms to get you started. This is essential for any breast pump as it will affect how much milk you get. When buying a breast pump look out for the effort the brand has made to ensure comfort. Soft breast shields, cushions, custom fit and good handle designs are all good sign the pump is comfortable. Remember you’ll be expressing for around 15-30 minutes, so your breast and hand need to be pain-free during that time. Manual breast pumps are usually used for work or travel. They are so much easier to carry around than an electric breast pump. You may want to consider other features that make it portable. A carry bag is handy to keep all the parts in one place and not scattered over your bag. How the milk is collected is essential, especially if you are keeping it for baby. Look out for pump which has a two-phase expression to copy baby’s suckling and get more milk. You also need to consider what bottles are included with the pump. 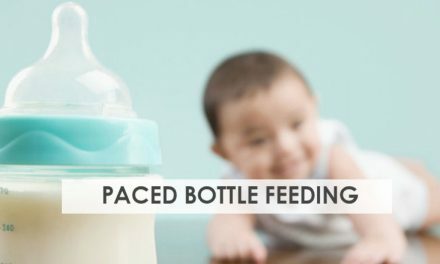 You’ll get a collection bottle, but not necessarily a feeding bottle. You’ll need to consider whether the pump is suitable to use with other brand bottles, or if you need to decant into a feeding bottle. 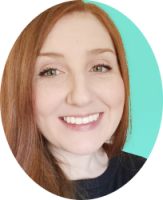 Your breast pump needs to be easy to use, or it will frustrate you. Check how many parts the pump has. Too many fiddly little pieces mean it is a pain to assemble and clean between uses. The pump action of the bottle is also very important. A pump which is nice and smooth to use will cut down on hand fatigue, which is a common issue with manual pumps. Using a manual breast pump can have many benefits compared to hand expressing or using an electric breast pump. 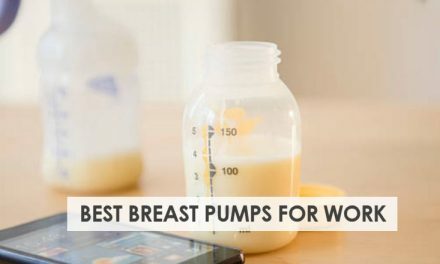 Manual breast pumps are very budget friendly. You’ll be able to pick one up for around $30 or less. That’s not a huge initial outlay, especially if you are not going to use it very often. Compared to electric breast pumps, manuals have a lot fewer parts. You don’t need to worry about milk back flowing into motors and tube, causing mold. You can clean all parts of a manual pump between each use. As there are fewer parts, manual breast pumps are usually easier to assemble than an electric breast pump. Some newer silicone suction models require no assembly at all. It’s very easy to use a manual breast pump. Set it up and simply push a lever up and down. With an electric breast pump, you need to find your comfort setting with dials and buttons. Some moms find electric breast pumps painful to use even on the lowest setting. Manual pumps mean you have full control over the pump suction. This can provide an extra comfort feature for you to express more milk. Manual breast pumps are very lightweight and compact to carry around. The few parts make them a lot more convenient to carry than an electric breast pump with a motor. Discreet expressing is essential when you are pumping in a public place such as work. 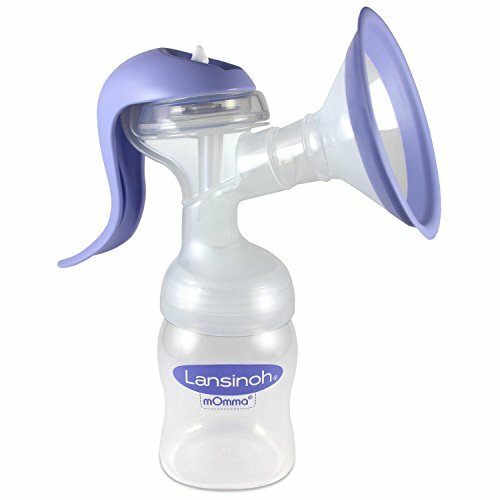 The lack of motor makes a manual breast pump virtually silent to use. The lack of motor means you don’t need to worry about finding a power source to pump. There is also no cost to worry about with electricity or battery supply. You’ll never need to worry about running out of charge or using it during an emergency situation such as a power cut. A manual breast pump is extremely low maintenance. You don’t need to worry about buying extra tubing or a motor wearing out. You are more than likely to get the use of a manual breast pump through a few babies. The biggest drawback of a manual pump is the problem of hand fatigue. Pressing a lever up and down for 15-30 minutes can result in some serious hand fatigue. 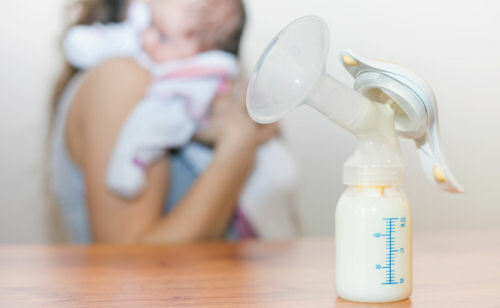 Some moms find that manual breast pumps are not effective enough for them. They simply need the stronger suction that you can only get with an electric breast pump. You can buy two manual pumps and double pump; however, it really is a hassle. Plus, you can’t switch hands if you start to get hand ache. If you need to pump double, we highly recommend getting an electric breast pump. Electric breast pumps are much quicker at getting more milk than a manual breast pump. They have a stronger suction. Plus unlike your hand, they pump at a constant rate. You tend to slow down toward the end with a manual pump.